Okay, I don’t really judge anyone for using poor grammar. I mean, not really. Okay, maybe just a little. But just a little. 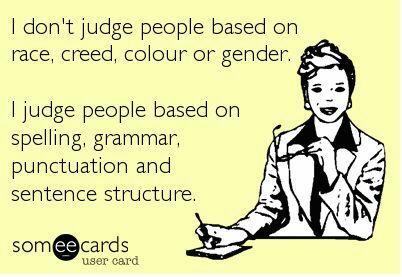 You do judge people based on their diction. I Like it, great card! It´s a way of complaining about how bad we, people, write and talk… I can´t say much about English but I can say it about Spanish… it´s terrible to find out so many mistakes everywhere, even in highly prestigious web pages… Great work! Would it have killed them to include an Oxford comma?